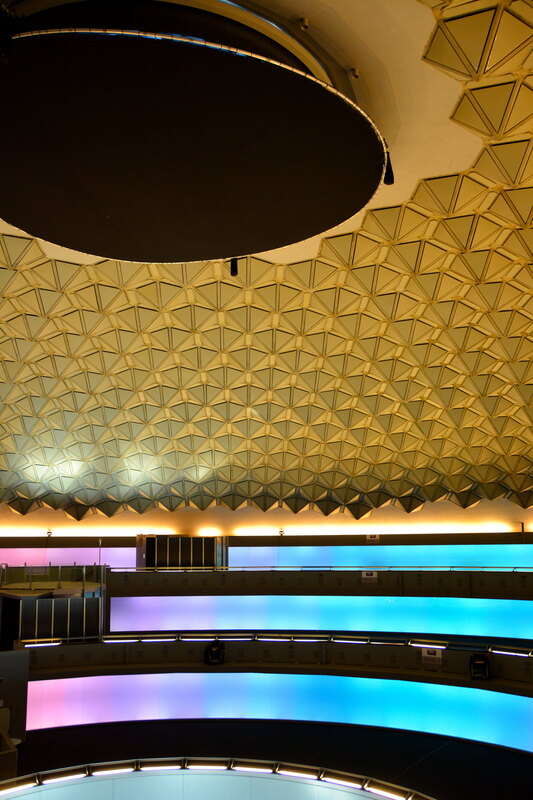 Just over a ten minute walk from Strijp S you will find one of Eindhovens greatest architectural hotspots, the Evoluon. It looks like a spaceship from the movie independence day, that has just landed in Eindhoven and the aliens are out for a drink. This place has really nice photo-opportunities, architecture, and it has a restaurant/cafe, a (sunny) terrace and the dome is used for conferences and parties/concerts. Kraftwerk held a really big concert here in 2016, because techno originated from Eindhoven. The Evoluon was built from 1964 to 1966, an idea created by Frits Philips to celebrate the 75th birthday of Philips. His vision was to give back to the people and to create a positive feeling towards companies and technology. Over the years the exposition of mostly futuristic and technical products and design in the Evoluon attracted more than 10 million visitors, especially younger people and was one of the biggest tourist attractions in Holland. Philips wanted a building as a present to the city of Eindhoven that would last for years and that would be a reference to the future of mankind. At the time of creating the idea of the Evoluon, space-exploration technology was ‘hot’ and thus the elliptical shape that looks like an UFO was born. I remember visiting the exposition at the Evoluon when I was a kid with my brother and dad. Besides from being a extraordinary building, there was so much to see and do, like machinery, technical equipment and little science tests. It was one of the first expositions that was interactive, you were allowed to touch almost everything out there. Just like the museums nowadays for example the Smithsonian in Washington D.C.
After declining numbers of visitors and being closed for a couple of years, the Evoluon reopened as a business and conference center with tradeshows and expositions, of which some are open to the public. The garden (take your camera with you!! ), terrace and restaurant (9-20h) are almost always open to the public, unless there is a closed convention or business day. Look it up on the website of the evoluon to be sure. The dome is only accessible when public expositions are held, like the running Evo-Lumen expo about the evolution of light in art and design (starting the 14th of april 2017, end-date unknown- accessible for free from 14-20h). More info can be found on www.evo-lumen.com and the exposition is created together with the van Abbemuseum and others. Go and check it out, because besides the expo being interesting, you will be in awe of the sheer space of the dome and what it looks like from the inside. Inside the dome are several ‘rings’ and the open space is so big they had to use cool looking acoustic piramidic shape panels to make it possible to hear one another. It was Philips’s wish to have the Evoluon play a role in being an icon for the future and to be appealing and accessible to the public. Hopefully it will remain a public space, open to Eindhoven- and other visitors for years to come! 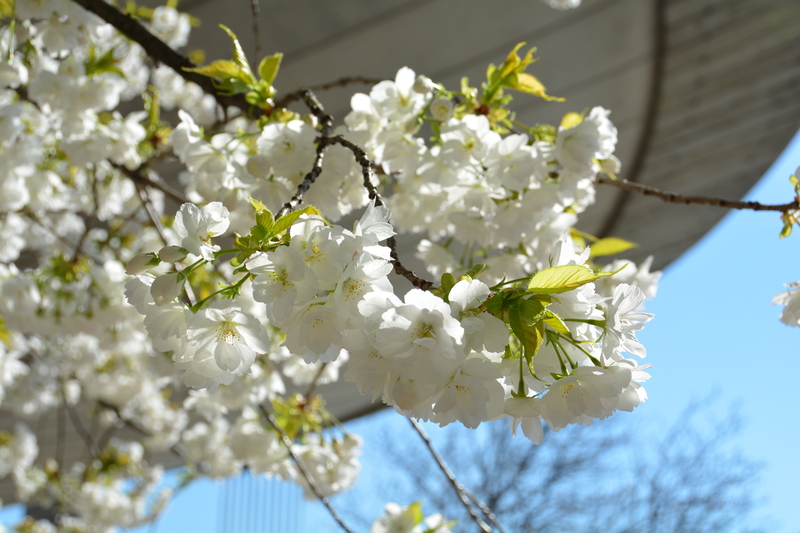 Whenever you visit Eindhoven, don’t forget to make a stop at the Evoluon, take your camera with you and check out the terrace with a lovely Cherry blossom tree. Have a cup of coffee, lunch or dinner and take home a memory of having been in or near a UFO-shaped building. Although this doesn’t look like a buzzing hotspot, it’s really worth looking around the Evoluon. Combine your visit with more hotspots nearby. Check out my blog on Strijp S, also a photography and architecture hotspot. Enjoy! 29 april 2017 | Filed under Art spots, Coffee spots, Lunch spots, Terrace spots.